First of all: it's great to see fellow researchers screening larger (i.e. hundreds) of faecal DNAs by PCR for Blastocystis. I wish more people would do that to produce reliable data on prevalence and subtypes. Now, as I've already mentioned, there are currently mainly two methods in use for subtyping, barcoding and STS PCR, and recently I evaluated these. To cut a long story short, barcoding is recommended for subtyping, since the STS method, which was used in the study by Tarasova et al. (abstract), appears to miss the majority of ST4 strains (the major genotype), and moreover, no STS primers exist for ST8 and ST9 (or any of the other 8 subtypes identified to date, but which have only been found in animals). So, the subtype data found in this study should be interpreted with this in mind. Importantly however, I'm not sure whether the authors used the original Yoshikawa STS terminology or the terminology acknowledged in our 2007 consensus. First, let us assume that consensus terminology is used. Then it's surprising to find ST5 in human samples in the first place, and finding a ST5 prevalence of 45% in a cohort of humans included in a larger study like this is very unlikely based on current evidence of more than 3,000 observations from all over the world, where the overall prevalence of ST5 in humans is <1%. Also, finding so much ST6 is also really striking. Also, if the consensus terminology is used, then I'm a bit puzzled why the authors put emphasis on ST7 not being found, since ST7 is relatively rare in humans. But what is more: STS subtype 5 translates into ST2 in consensus terminology, and similarly STS subtype 6 equals ST5 (yes, it may seem confusing, but we have provided a table in the 2007 consensus paper to make this easy). This means that no matter which of the two terminologies were used, ST5 is seen in abundance in patients with CVH in St Petersburg! Which is a very remarkable observation, and maybe more interesting than the rest of the data, which I, by the way, find a bit difficult to follow (I expected to learn something about Blastocystis invasion, when I read the title of the abstract, but there is no data or information on invasiveness... and I'm very curious as to how the authors managed to obtain such a high number of samples from 'healthy people'! To evaluate the prevalence of Blastocystis in the control group, demographic data are needed, and a prevalence as low as 5.3% among healthy individuals makes me suspect that this control group consisted of newborns/toddlers who generally have a low prevalence of Blastocystis). Also, since when was ST1 'zoonotic'? Anyway, often conference abstract are previews of upcoming articles, and so I expect that there will be a paper out soon from this group, and hopefully these issues will be clarified. The occasional confusion in Blastocystis epidemiology could be reduced to a minimum if everyone got into using barcoding and the Blastocystis 18S subtyping site (and go here for a video introduction to Blastocystis subtyping). 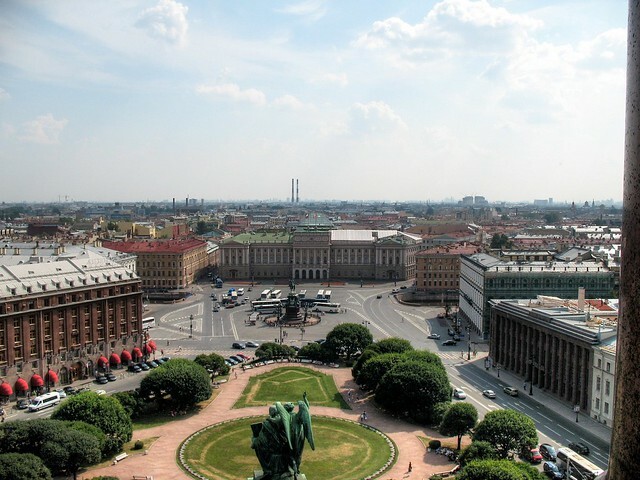 Tarasova E, Suvorova M, Sigidaev A, Suvorov A. Blastocystis invasion in patients with chronic viral hepatitis in Saint Petersburg. ECCMID 2013 abstract O338. I've been extremely bored all day writing up my evaluation of a (not so interesting) PhD thesis, and I thought I'd spice up my day by introducing a new series of posts on this blog inspired by so many other blogs, namely: This Month in Blastocystis Research! A place for me to go through some of the most recent papers on Blastocystis. There is paper out by Gould and Boorom who look at the stability of Blastocystis surface antigen over time. They show that detection of Blastocystis by an immunofluorescense assay (IFA) is not hampered after1 year of storage of faecal material in formalin compared to results immediately after the sampling point. Detection of Blastocystis by IFA is something that is not often used (that's my impression, anyway), but makes sense in cases where laboratory analyses can be performed only weeks-months after sample collection (e.g. during field work), in which case samples need to be preserved. We usually, however, recommend storing faecal material in (70%) ethanol (in the relationship 1 part faecal sample to 4 parts of ethanol), where the sample is mixed with the ethanol initially by vortexing the tube (typically a 2 mL Eppendorf tube) for 5-10 min, and subsequently keeping the tubes away from light until further processing. Importantly, in contrast to formalin-fixed stool, ethanol-fixed stool can be made highly suitable for PCR by just washing the samples x3 in PBS prior to DNA extraction. An example of this methodology can be seen in our study of Blastocystis in members of the Tapirapé tribe in Mato Grosso, Brazil (go here for a free download). I'd wish that Gould and Boorom had validated their findings by running a PCR on the samples too (specificity and sensitivity testing). The IFA assay was also used in a publication from 2010 by Dogruman-Al et al., who found a diagnostic sensitivity of the IFA assay of 86.7% compared to culture; also here, adding PCR would have been relevant to better determine the diagnostic qualities of the IFA assay. 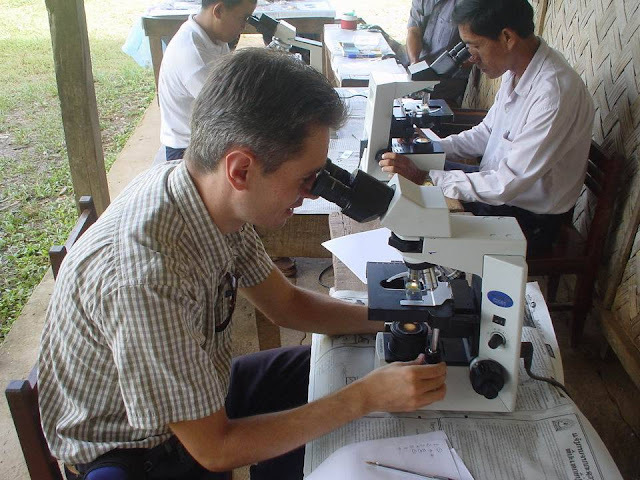 I was lucky to be involved in field work in the Lao PDR in 2003 conducted by regional WHO authorities; preserving and analysing faecal samples for parasites by microscopy (Kato Katz) and - later - PCR was what we did! Adding to the endless row of cross-sectional prevalence papers, there is an article out just now by Abdulsalam et al. (2013) on Prevalence, predictors and clinical significance of Blastocystis sp. in Sebha, Libya (free for download here). The study used culture (Jones' medium) as diagnostic modality and confirmed the existence of frequent asymptomatic carriage. The authors used questionnaire info and multivariate statistical analysis to identify risk factors for Blastocystis carriage among 380 individuals aged 1-75, and what I find really interesting is that they found that participants aged > 18 years were much more prone to having Blastocystis than participants < 18 years (P < 0.001). This is something that we see in Denmark too, and I'm currently trying to collect "sufficient proof"! Whether this is an age accumulation effect due to the chronicity of colonisation remains to be investigated. The authors also found that carriers were more likely to experience symptoms than those who were not carriers (P < 0.001), mainly abdominal pain (P < 0.001), but notably not diarrhoea (P = 0.117). May I also again draw your attention to our recent paper on Blastocystis in non-human primates, in which we find that despite the fact that there is a great overlap of subtypes in human and non-human primates, it appears that ST1 and ST3 strains found in non-human primates differ genetically from those found in humans, indicating cryptic host specificity. We have additional data supporting the theory that Blastocystis in humans is a result of human-to-human transmission (anthroponotic) rather than animal-to-human (zoonotic) transmission. Which is really interesting, since the theory of zoonotic transmission of Blastocystis has been heavily (I dare not say purported, so I'll say) propagated. Having said that, I think we still need to look much deeper into barcoding of Blastocystis from pets and other synanthropic animals before we can make more poignant conclusions. And, finally, yet another add for our recent review on Recent Development in Blastocystis Research! 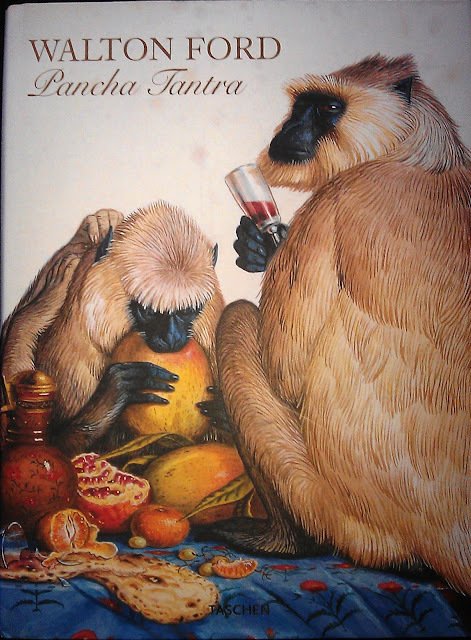 Please note that I'm happy to take suggestions for future posts, and I'd also like to encourage guest blogging! I would like to draw your attention to an open access link to our 2013 review on Recent Developments in Blastocystis Research; please go here to read/download the paper. Blastocystis is a common parasite of the human large intestine but has an uncertain role in disease. In this review, we appraise the published evidence addressing this and its weaknesses. Genetic diversity studies have led to the identification of numerous subtypes (STs) within the genus Blastocystis and, recently, methods for studying variation within STs have been developed, with implications for our understanding of host specificity. The geographic distribution of STs is summarised and the impact this may have on investigations into the role of the organism in disease is discussed. Finally, we describe the organelle and nuclear genome characteristics and look to future developments in the field. 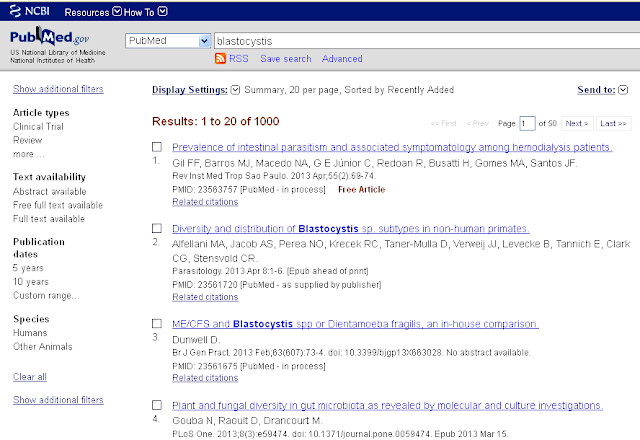 Yesterday, the number of Blastocystis entries in PubMed reached 1,000! PubMed is a public resource comprising more than 22 million citations for biomedical literature from MEDLINE, life science journals, and online books. In comparison, there are currently 7,641 entries on Entamoeba, 6,630 on Cryptosporidium and 235 entries on Dientamoeba. 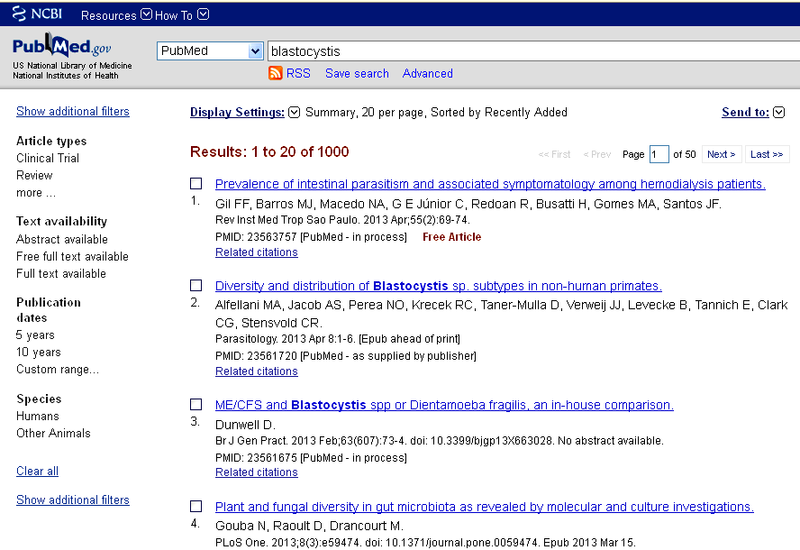 I plan to introduce the "Hall of Fame in Blastocystis Research" in a future post, but already now I can reveal that the researcher with most Blastocystis-related publications is Dr Hisao Yoshikawa according to Web of Science (WoS), which currently returns 895 hits on a search on Blastocystis; Dr Yoshikawa has at least 43 publications on Blastocystis alone (WoS), and at least 37 Blastocystis-specific peer-reviewed journal articles (PubMed) since 1987. I'm experiencing a problem with my post titles being displayed as uncials (sort of nested in each post with blog text wrapped around it), when using Firefox or Chrome (also the headline link function has been disabled). I'm trying to fix it, but for now, I recommend viewing the blog in Internet Explorer rather than eg. Firefox or Chrome. If anyone knows how to fix this, please give me a shout!